56 HENRY is delighted to present No Weather Data Available, an exhibition of new work by Hanna Liden, on view from March 30 through May 1, 2016. 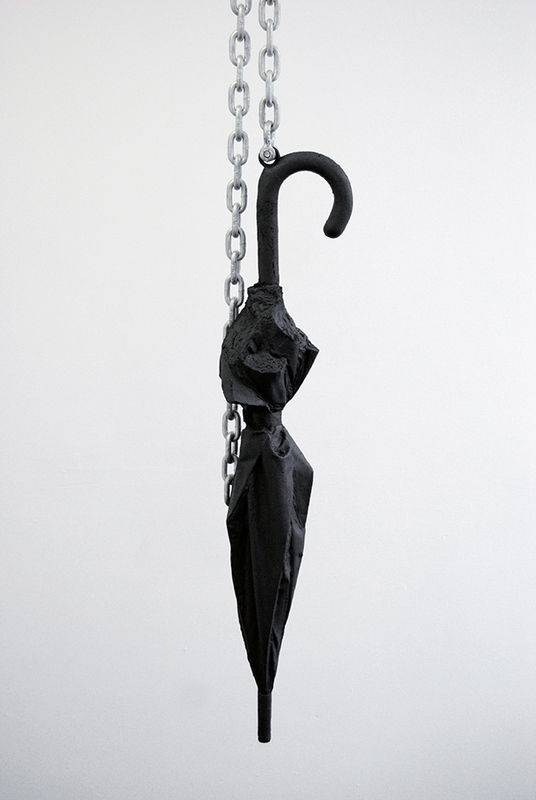 In the main gallery, Liden presents three cast-concrete sculptures, all molded from crook-handle umbrellas. 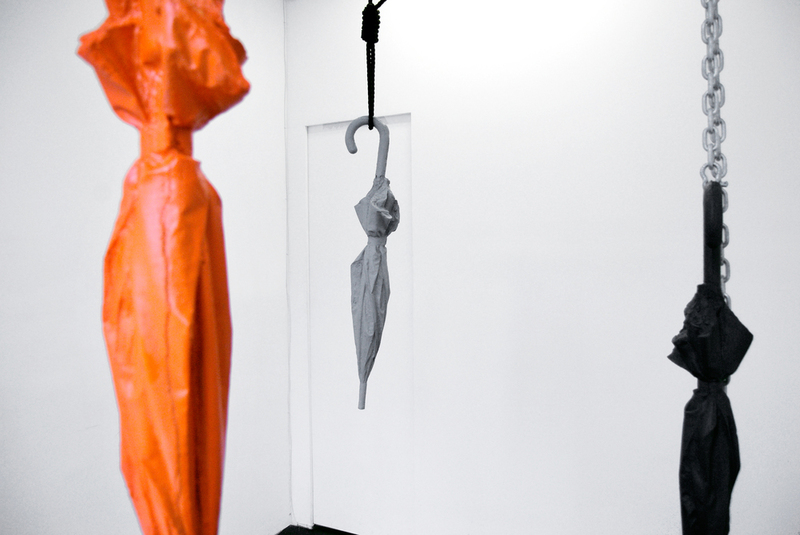 Rendered in battleship grey, deep charcoal, and cautionary orange, the umbrella sculptures are suspended at inconsistent heights from the gallery ceiling. 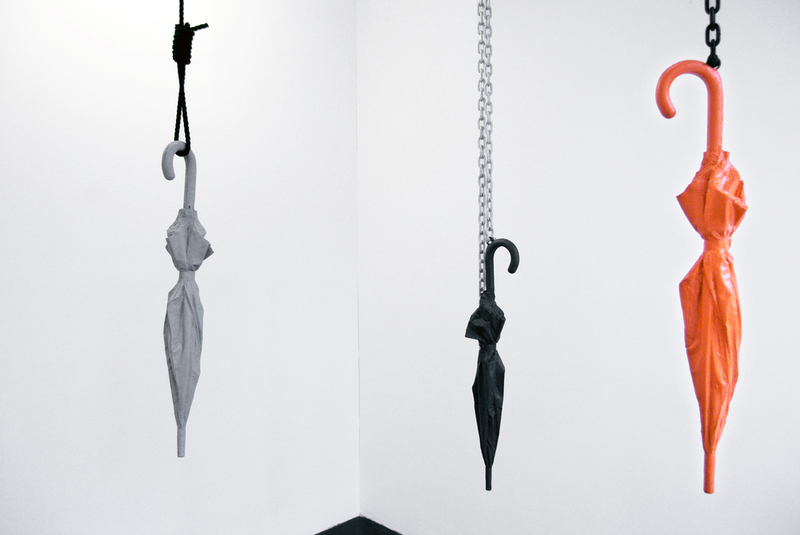 Two umbrellas dangle from welded industrial chain, and a third hangs from a noose looped around its handle. Strung up by their necks, the casts begin to resemble bodies hanged from an executioner’s scaffold. 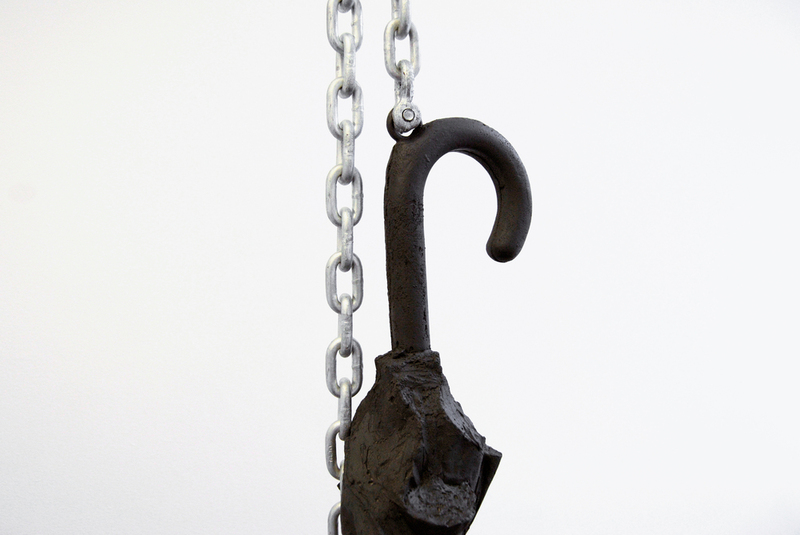 The genesis of Liden’s sculptures is in curbside detritus and recognizable urban material. Plastic bags and aluminum cans populate her output as often as umbrellas, and her sculptural and photographic interventions transform these objects into shades of their former selves. Petrified in concrete, Liden’s umbrellas are permanently closed, useless against rainstorms and heavy winds. Her objects are tragicomic follies, slapstick approximations of quotidian objects, or possibly fossils from an extinct civilization, hung up for display. Hanna Liden lives and works in New York. Her work has been exhibited internationally at Galleria Lorcan O’Neill, Rome (2013); Massimo De Carlo, Paris (2012); Gewerbemuseum, Switzerland (2010); Palais de Tokyo, Paris (2011); Museo d’Arte Contemporanea, Rome (2008); and the 2006 Whitney Biennial, Whitney Museum of American Art, New York. Hanna Liden is represented by Maccarone. This is her first exhibition with 56 HENRY. 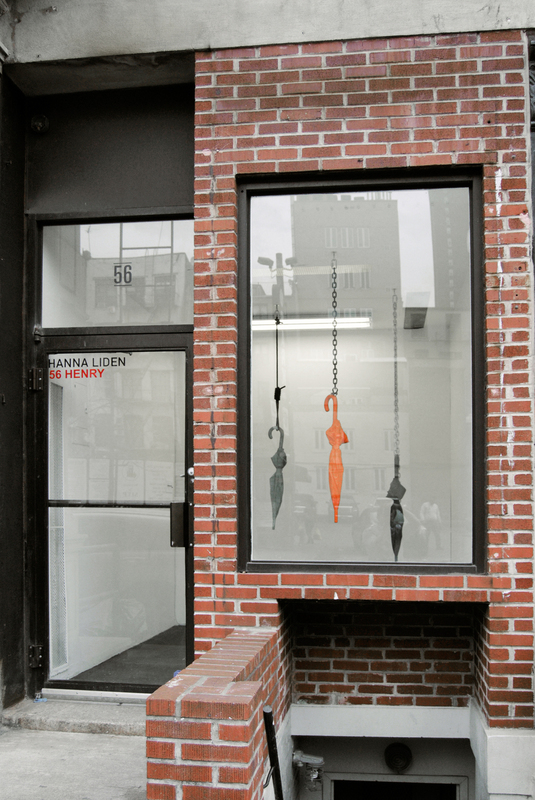 Exhibitions at 56 HENRY are visible 24 hours a day. Gallery doors are open to the public on Thursdays through Sundays, 12:00 – 6:00 pm. For additional information, please contact Ellie Rines at (646) 858-0800 or info@56henry.nyc.